Several years ago I attended an opening at the Valley House Gallery in Dallas and was speechless at the splendor of the painting genius of Robert Cocke (pronounced Coke). I remember meeting Mr. Cocke that night and telling him if I could paint like him, I would get rid of my sculpting tools and never do sculpture again! I LOVE his work and wish that I could handle paint like he can. His manipulation of oil paints, his precision with brushes and his understanding of space takes my breath away. 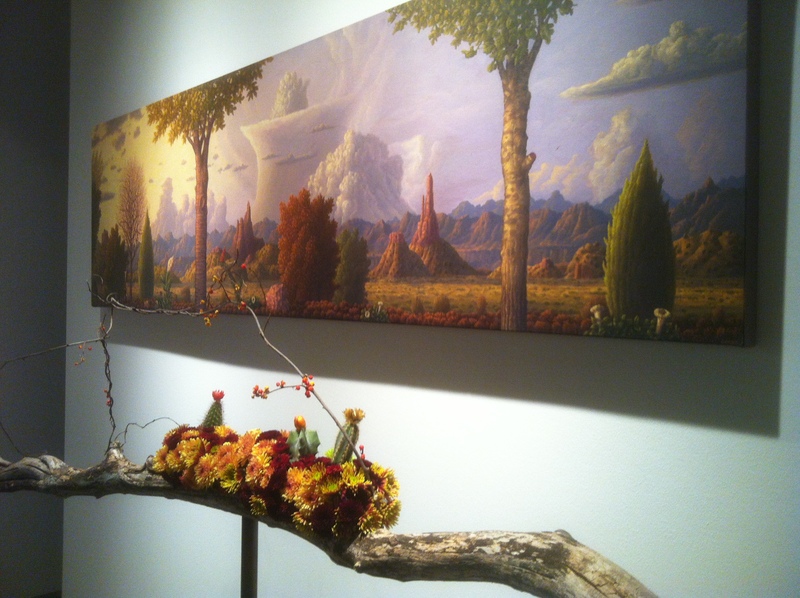 Cocke is from the Tucson, Arizona area, and I could have guessed that by the other-worldly landscapes that he paints. His fantastical landscapes combine quirky thunderclouds, blustery autumn leaves, odd, geometric forms and incredibly textured mountains, trees and pasture-like vistas. When I gaze into his paintings, I find myself wanting to live inside them, like in the movie What Dreams May Come (highly recommended if you have not seen it, btw…). In the early 1980’s I drove to Tucson with my then-roommate and painting professor, Judith D’Agostino. Judith, also a landscape painter who formerly lived in Tucson, acquainted me with the wacked out sunsets and alien landscapes that I recognize in Cocke’s work. There are many landscape painters in Arizona and no wonder! The unusual Saguaro cacti thrive only in this small portion of the United States which is protected by the Saguaro National Park. When winding through the mountains filled with Saguaros, I felt like I was on another planet! Cocke’s current exhibition opened on October 6 at Valley House, but I decided to forego the crowds and wait a couple of weeks. I’m sure glad I did, because this past weekend when I went, a special event was going on at the gallery that took me into yet another distant land! The Dallas Chapter of Ikebana International was showcasing the talents of their Ikebana artists throughout the gallery and gardens of this beautiful hideaway in north Dallas. Ikebana is the Japanese art of flower arrangement and on this day, the arrangements celebrated the Chrysanthemum. These carefully arranged and uniquely designed living sculptures are designed to draw emphasis toward shape, line and form, three of the elements of art. By studying and gazing at Ikebana arrangements, we are forced to slow down and notice small details, appreciate nature and take a break from the busy nature of our lives. On the inside of the gallery, the flower arrangements were nestled next to the Cocke paintings and co-habited the floor space well. The colors and textures of paintings and flowers melded together and each seemed to point to the other. Out in the gardens, the flower sculpture arrangements grew large, some as large as the ceramic and steel sculptures that dot the landscape of the Valley House gardens. The Ikebana creations were lovely and made me long for a trip to Japan! So far, I haven’t seen an art teacher opening in Japan, but if I do, you can sure bet I’ll fill out that application! So enjoyed the blog, especially the Ikebano painting. Our grandchildren’s other grandma is an Ikebano instructor and was recently honored by Ikebano. How cool to have an Ikebana instructor in the family! That’s a real honor to be honored by the organization. How wonderful! Thank you for reading! 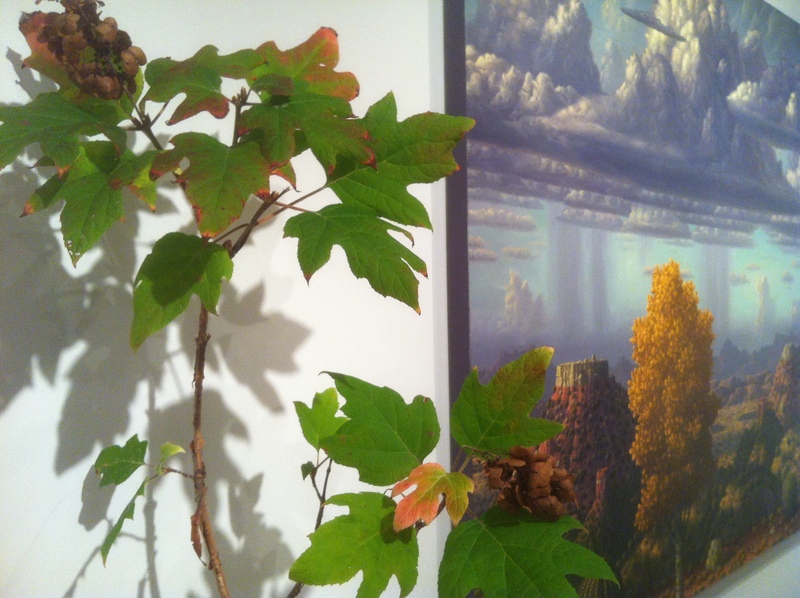 We are so happy that you enjoyed the ikebana exhibition. 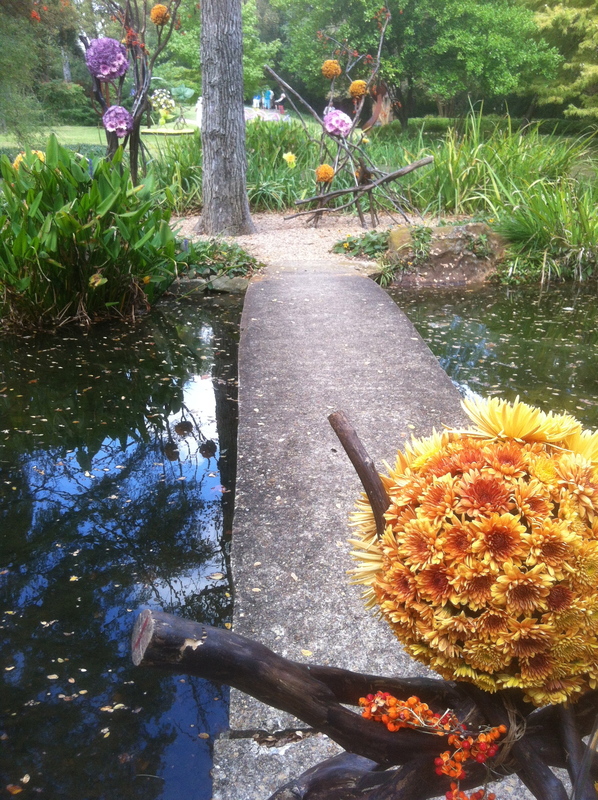 It was a special one – Kiku Matsuri 2012 – sponsored by Ikebana International. “Kiku” in Japanese, translates to chrysanthemum; Matsuri loosely translates to “festival.” This was the first of a grand scale exhibition for our Ikebana Chapter. I hope that we will do more of these exhibitions in the future. We found so many artists who were not familiar with this art form, and who are interested in learning the Japanese art of flower arranging. You cited our website already in your blog post, so I will not repeat. However, please be patient as this week we are finalizing and “going live” with an updated web site. Wasn’t it a perfect weekend for your Kiku Matsuri 2012? Good luck with your new website! I’m so glad people in the DFW area are interested in learning more about ikebana. Good work! I’ll look forward to more events in the future! Beautiful! Love to read your writing and see the world of art through your eyes! Thanks for being a blessing by sharing your passion! Hi, Kelly! Thank you so much for your encouragement! I didn’t know you read my blog! Yea! 🙂 See you this next weekend! Oh, Amy, you’d love Cocke’s work. I forgot you went to school in Tucson. I love that place!